WASHINGTON (Nov. 02, 2011) -- Hundreds of former Soldiers, wearing blue and red veterans caps bearing the names of their World War II units, walked, shuffled or were wheeled in to the Capitol Visitors Center here, Nov. 2, to witness the presentation of the Congressional Gold Medal awarded for their bravery and contribution to country more than 66 years ago. They were Japanese-American Soldiers, the American-born sons of parents who immigrated to the United States from Japan, that were honored. In Japanese, they are called Nisei -- the second generation. 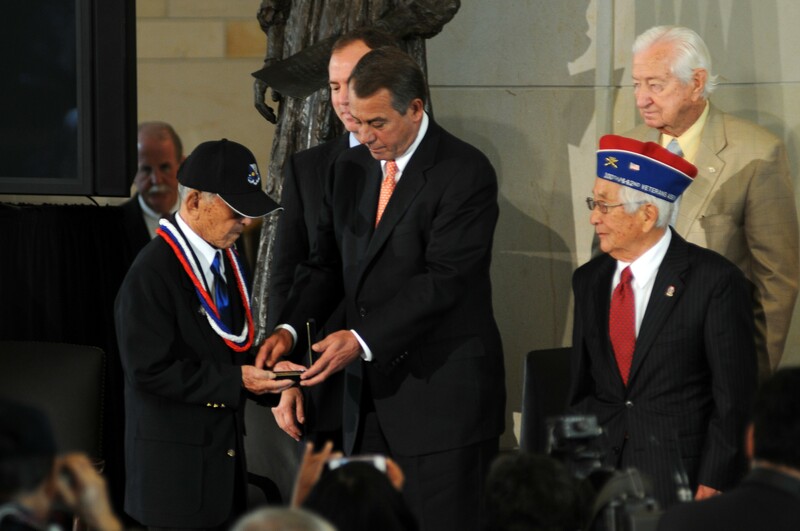 Rep. John Boehner presents the Congressional Gold Medal to a representative of the 100th Infantry Battalion, Mitsuo Hamasu, during a ceremony Nov. 2, 2011, at the Capitol Visitors Center in Washington, D.C. The Congressional Gold Medal is awarded by the American Congress, and is the highest civilian award in the United States. The medal was awarded to Nisei Soldiers -- American sons of Japanese-born parents -- who fought in World War II. Those Soldiers fought as part of segregated, all Japanese-American units that included the 442nd Regimental Combat Team, the 100th Infantry Battalion and the Military Intelligence Service. The three units together were the most decorated units of that war. But those Soldiers are all American, and fought for the United States during World War II as part of segregated, all-Japanese-American units that included the 442nd Regimental Combat Team, the 100th Infantry Battalion and the Military Intelligence Service. The three units together were the most decorated units of that war. Following the attack on Pearl Harbor, Dec. 7, 1941, Japanese-Americans had been rounded up and were forced to live in internment camps inside the United States. They were branded enemies of their own country. 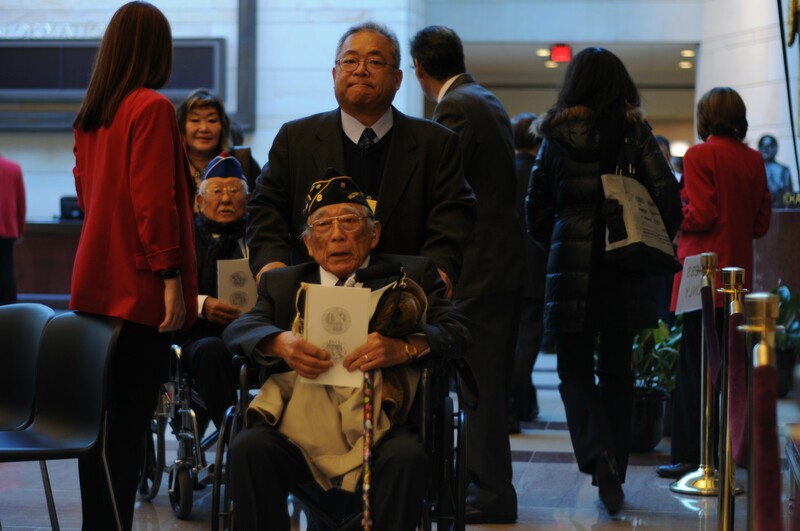 "For Japanese-Americans, the days and months after Pearl Harbor must have seemed like a giant and painful step backward," said Rep. John Boehner. "Removed from their homes and placed in camps, these loyal Americans endured years of discomfort and disgrace. But out of this story of prejudice comes another story that reaffirms America's worth and America's exceptionalism. Today we honor the thousands of Japanese-Americans who served in the Army's three units we honor today, most of whom were recruited during their internment." These Japanese-American Soldiers, Boehner said, distinguished themselves in nearly every operation in every theater of World War II. "On behalf of my colleagues and the American people, thank you for fighting to make this the greatest nation on Earth and God bless all of you for all of your work," Boehner said. Sen. Daniel Inouye, a Medal of Honor recipient, was also a recipient of the Congressional Gold Medal. As a Nisei himself, he had served as part of the 442nd Regimental Combat Team during World War II. Japanese-American veterans from WWII arrive, Nov. 2, 2011, at the Capitol Visitors Center in Washington, D.C., to attend a ceremony to award the Congressional Gold Medal to those Soldiers who served as part of the segregated, all Japanese-American units that included the 442nd Regimental Combat Team, the 100th Infantry Battalion and the Military Intelligence Service. The three units together were the most decorated units of that war. After Pearl Harbor, Inouye said, Japanese-Americans like himself were not satisfied to sit and do nothing while America fought -- he said those Japanese-Americans who had been interned petitioned the government for an opportunity to demonstrate their love of country and patriotism. Today, those Soldiers are recognized for their commitment to the United States, Inouye said. "This has been a long journey, and a glorious one," the senator said. "We wish to thank all of you, all Americans, for this recognition. It's heartwarming, and I am certain that I speak for all assembled here, but more importantly I'm certain that those resting in cemeteries, are pleased with this day." Sen. Barbara Boxer participated in getting the legislation passed to allow the medal to be presented to the veterans. "Granting this medal is a long overdue honor which recognizes and expressed our long overdue appreciation for your dedicated service during World War II," Boxer told those in attendance. She said those servicemembers fought the war on two fronts -- including both the enemy in combat, and prejudice at home. "While we can never repay the debt that we owe you, we can and we must recognize your valor and your patriotism, and that is what we are doing here today," Boxer said. Sen. John McCain said America's Nisei veterans of World War II did "everything that was ever asked of them and more. And what is most remarkable is that they did so despite the fact that our nation at times fell short of its responsibilities to them, and Americans like them." 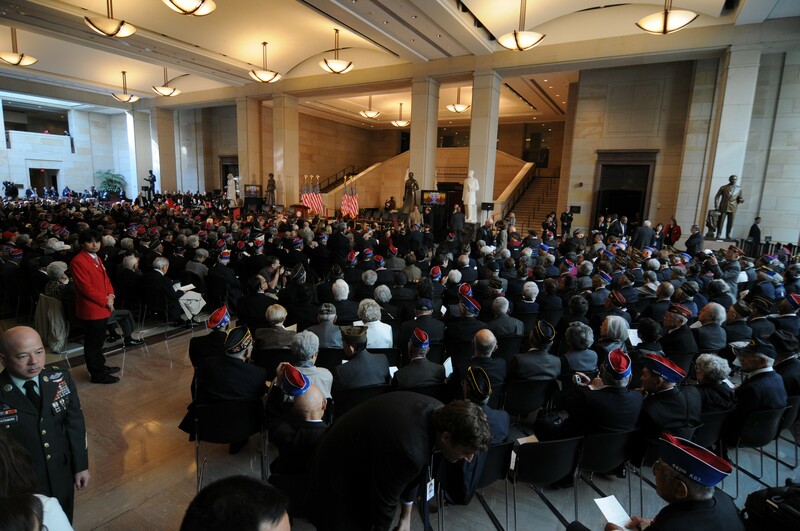 Hundreds of Japanese-American veterans of WWII and visitors attended a Nov. 2, 2011, ceremony at the Capitol Visitors Center in Washington, D.C., to award the Congressional Gold Medal to those Soldiers who served as part of the segregated, all Japanese-American units that included the 442nd Regimental Combat Team, the 100th Infantry Battalion and the Military Intelligence Service. The three units together were the most decorated units of that war. McCain also recognized that while lawmakers are in disagreement about many things, the merits of the Japanese-American veterans is something they are in agreement on. "It's not every day that the leaders and members of Congress have an opportunity to put aside our usual difference over the impending business of the day, to join together with bipartisan unanimity, to pay tribute to fellow citizens who have served a just cause greater than their own self interests," McCain said. "When it comes to honoring those among us who have given everything to protect our nation, Americans have always and will always stand as one, just as we do today." Rep. Nancy Pelosi said the gathering to award the Congressional Gold Medal is not complete -- many of the Soldiers who served were killed in combat, or have died since the end of World War II. "We remember those for whom today came too late, and we particularly honor those who never came home," Pelosi said. "In battle, today's awardees proved that they were great fighters, in their service, they proved they were great patriots. Your cause was not just the end of fascism, but promoted the end of discrimination -- the American ideal of equality, which is our heritage and our hope." The Congressional Gold Medal is awarded by the American Congress, and is the highest civilian award in the United States. Veterans in attendance at the ceremony receive a bronze replica of the medal. A single gold medal will be placed in the Smithsonian for all Americans to see. Over 33,000 Japanese-Americans served in World War II. Together, the 100th Infantry Battalion and the 442nd Regimental Combat Team earned seven Presidential Unit Citations, two Meritorious Service Plaques, 36 Army Commendation Medals, and 87 Division Commendations. Individually, Soldiers earned 21 Medals of Honor, 29 Distinguished Service Crosses, one Distinguished Service Medal, more than 354 Silver Stars, and more than 4,000 Purple Hearts. The units together are the most decorated units in Army history. Today, they, along with the Military Intelligence Service, also staffed by Japanese-Americans, add the Congressional Gold Medal to their list of decorations.